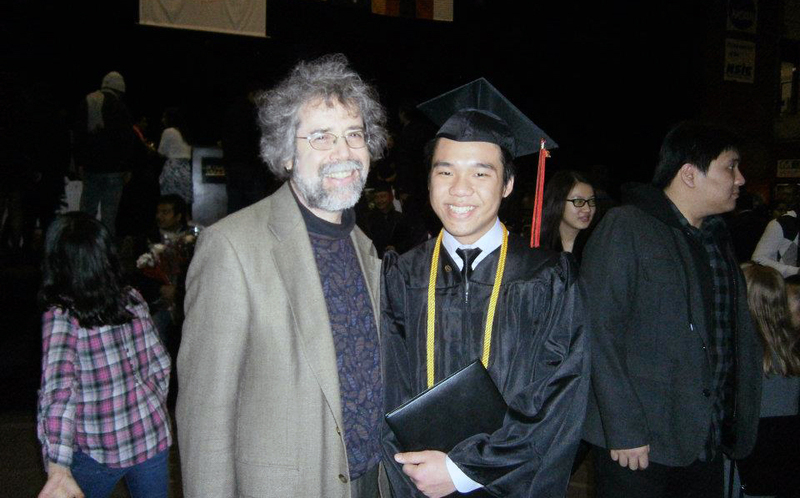 My ad professor and I during my 2011 undergraduate commencement ceremony. About two and a half years ago, I wrote my arguably “last entry for the Chronicle” as I was graduating with my bachelor’s degree from SCSU. I called the piece “Graduation Giveaway” because I thought I had some expertise opinion in helping college students succeed in college. Sure as planned, the piece received some rather positive responses from the community and friends, and I was overwhelmed as new college students – mostly international students – start referring to me as the go-to person for pointers to resources on campus. Yet, as I found my way back to grad school in the fall of 2012, I began to see school in a whole new light. In my original 5-tips-to-college-success article, I urged college students to make the most of their college resources, from going to cultural nights, to trying to live on campus, to buying their professors coffee. I saw college as the one-time experience that all of us should treasure. However, grad school has given me a different kind of lemon altogether. So, I feel compelled to share my thoughts here — my official last entry for the Chronicle — before I walk down that aisle again next week; this time with two master’s degrees. While most of what you will find below might refer heavily to graduate students life, I think they are still relevant to college students of any level (since I hang around undergraduate students quite a bit, too). Try taking classes with the “hard” professors. I have always strived to stay on top of my grades and found my ways into classes I knew I would succeed. But hey, life outside college doesn’t always give us options we’ll like to choose. Thus, the college classroom is the perfect place to challenge oneself with difficult subjects and tough teachers. Use some of your elective quotas to sign up for a class that’s out of your range — something that take you out of your comfort zone and put you into player’s mode. Take a class on statistics, take one in philosophy, try radiologic technology. And if you’re in the mass communications department, try Professor Przytula and his Mass Media and Society course. What I’ve learned from taking hard classes with hard professors is that I am pushed beyond my limits and that helps bring me to new heights in my professional development. Know your technology. Know what you can do with your smartphone besides making calls, snapchatting, and taking selfies. The American society and its generation today are blessed with edge-cutting innovations and technologies that redefine what learning means in the 21st Century. As you prepare yourself to graduate college and enter the competitive market of labor and intelligence, being literate in new media and being adaptive to change will put you in a better position for hire. In your free time, i.e. Wednesday nights and the mornings after Saturday, check out some tech blogs and the technology section in newspapers like New York Times and USA Today to read about start-ups, the Internet, enterprise, and gadgets. Chances are, you will be asked to learn about these things in your future job anyway. Collaborate with others, as much as you can. Just as Taylor Swift and Boys like Girls sing, two is better than one. Human beings coexist to ensure sustainability of life. It didn’t take long for me to realize that we rely on one another to succeed in school. Our friends, teachers, and colleagues are invaluable resources to our academic endeavors. Working with others have opened my eyes and ears to things I have never experienced in my own life and expanded my social horizon. Besides, as an English and Mass Communication major, I found working with folks from other disciplines fascinating. They challenge my philosophy, work ethics, and overall views of life. So, try working in pairs or in teams whenever possible to get the most of a collaborative experience. Nonetheless, one advice that I remain faithful to is going above and beyond in all undertakings. Don’t just do the bare minimum to get by in your work. Find that passion that burns inside of you and that motivates you to do well, and use that energy to excel in your crafts. Going above and beyond may open up new opportunities that you may not otherwise encounter should you stay within the parameters of your responsibilities. Having said these, I am ready to move on. I hope you find these advice useful in your career, whether you’re a soon-to-be graduate or second-semester freshman. I wish you, faithful readers, all the very best in your pursue of knowledge, wisdom, virtue and profound happiness through your interactions with people, information, as well as your own thoughts. Good luck on your finals, and have a great summer. This article originally appeared in University Chronicle, Thursday, May 1, 2014. This is an awesome piece Jason! Great advice.